I was about eleven years old when the US Army Corps of Engineers began construction on Terminus Dam, named, I presume, for the end of the Visalia Electric Railroad line where a resort of sorts was established at Terminus Beach for local music and all-night dancing during the summer. 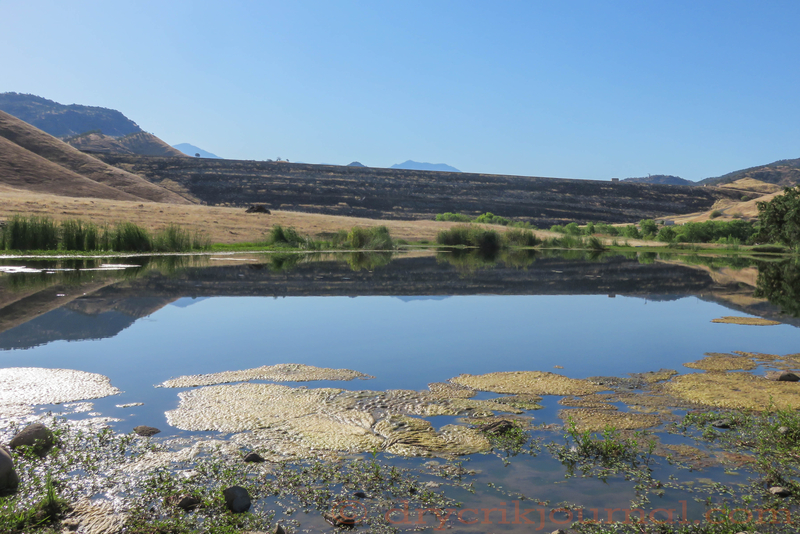 There was also a nine hole sand golf course in the area of this irrigation pond, north of the river, that was accessed by a footbridge across the Kaweah during the 30s. All was erased during the 1955 Flood. The family was embroiled in a Condemnation Action with the Federal government shortly thereafter. Construction was completed in 1962. Currently at less than 25% capacity because of the drought, it was unnerving for me as a teenager working downstream when Lake Kaweah was full. This entry was posted in Photographs, Ranch Journal and tagged Terminus Dam. Bookmark the permalink. At times like these, the debate that all rivers should be free flowing without dams must surely take on a new complexion. I was a little older than you when the dam was constructed. Many piles of field stone for dam rock fill were trucked from scattered farms at some distance from Terminus. From our farm in Round Valley (east of Lindsay), the Corps of Engineers hauled away a huge pile that had been accumulated for more than 50 years. It must have had the right qualities and hauling must have been cheaper than mining comparable material at the time. I remember someone commenting that the irregular shape and size of field stone is superior to smooth rounded cobbles for stability of the so-called earth-fill. The Columbia where I fish is harnessed by dam after dam after dam; still the steelhead and salmon find their way up to their spawning beds to reproduce year after year: the sockeye run on the waters below Chief Joseph dam are better than ever . . . Were it not for the dams we fishermen would have no place to fish! And the Washington would have no world class orchards . . . I liked your post!